Lithuania have won a major youth international basketball competition in this age group for the first time in their history. They were the only team that managed not to drop a game. Aurime Rinkeviciute, also from Lithuania, walked away with the MVP title. She was joined in the all-tournament team by Diandra Tchatchouang (France), Katerina Bartonova (Czech Republic), Cleopatra Forsman-Goga (Sweden)and Anastasia Logunova (Russia). The first five teams in the final classification have qualified for the U19 Women World Championships to be held in 2009. Sweden also won the fair play award. 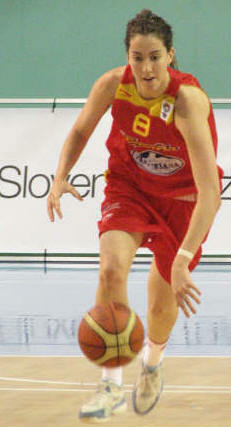 The final belonged to Aurime Rinkeviciute who was also named as Most Valuable Player (MVP). She scored 27 points which included 4 three-pointers. She took 8 rebounds and dished out 4 assists as her side maintained their unbeaten record in this tournament. Rinkeviciute was assisted offensively by Marina Solopova who scored 15 points and Giedre Paugaite who had 11 points and 12 rebounds. Rinkeviciute (left) opened the game with a three-pointer and Lithuania held their advantage for the first five minutes of the match (11-7). By the end of the first period they led by 9 points (22-13). However Russia made up all but one of the deficit as Lithuania went into the locker room with a reduced advantage (32-31). The third period was a tight affair with both sides having runs. However two seconds before the end of the third quarter Rinkeviciute hit another trey for Lithuania to go into the final perios with a 5-point lead (50-45). Russia chased the game throughout the last quarter and lost their top scorer Anastasiya Shilova to injury as they tried to level the score. Every time they got close Rinkeviciute was around to restore the Lithuanian advantage. Russia trailed by only 4 points (57-61) as the they scored their first and what turned out to be their last points of the game in money-time. They were unable to get anything going during the last 90 seconds. When Paugaite scored for Lithuania with 16 seconds to play, Russia's dream was over. Shilova led the scoring for Russia with 14 points. 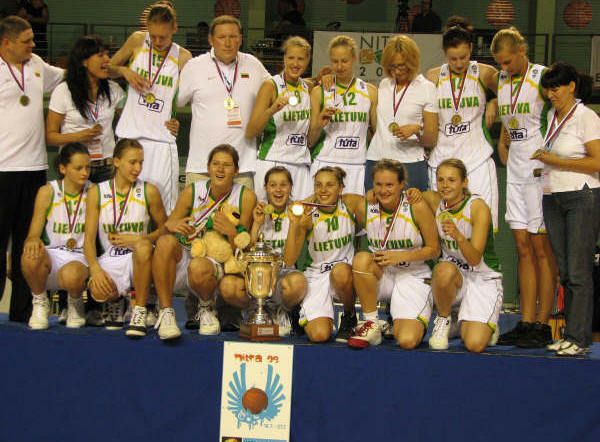 This victory was the first for Lithuania in the U18 age group. Lithuania celebrated their win with their trademark shuffle, first seen in France when they won the tournament in Rezé. France's European championship ended in disappointment as they lost the match for third place (61-70) against the Czech Republic. During the opening spell both sides appeared to be evenly matched until Karolina Elhotova (left) hit a trey for the Czech Rupublic to open the first lead of importance (11-5) with just four minutes on the game clock. 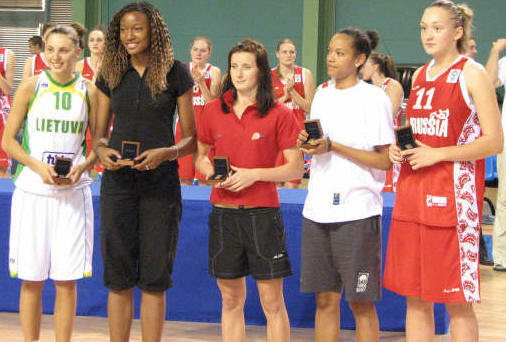 However Diandra Tchatchouang (right) brought France back into the game. By the end of the first period France trailed by only 2 points (15-17). Renata Brezinova and Elhotovo went to work offensively during the second quarter and made sure that their side held the advantage at the break (33-27). The difference in points between the two teams was in the three-point statistics. The Czech Republic were 2-of-6 while France went 0-for-8 during the first half of the match. France's troubles continued in the third period as Michaela Stara came out firing on all cylinders as she scored 10 of her team's first 12 points as they extended their advantage (45-37). France were worked up and with Pauline Thizy giving Tchatchouang a hand offensively, they went on a 14-2 run to take the lead (49-47) briefly. However the Czech Republic regained the advantage and closed the third quarter with a 9-0 run (49-59). The last quarter was hotly contested and France were back on level terms (58-58) with five minutes left to play. Clutch three-point shooting by Stara gave the Czech Republic the lead for good (63-58). Elhotova provided the final knock-out blow with a shot from beyond the arc (68-58) with just over three minutes to play. France were unable to recover and their opponents went on to win (70-61). Renata Brezinova had a team-high 16 points while Stara added 15 and Karolina Elhotova finished with 14 points for the winning side. 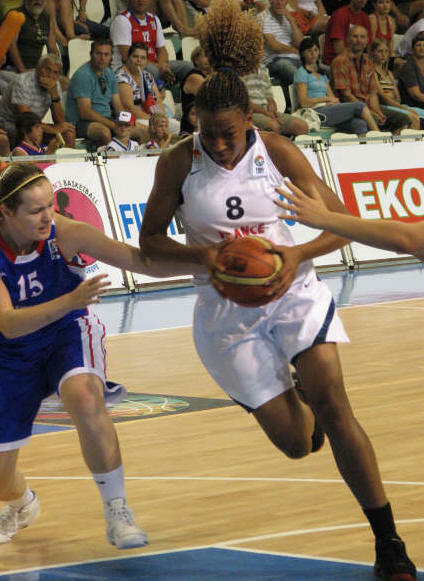 Diandra Tchatchouang had a game-high 27 points for France. Spain have clinched the last European place for the 2009 U19 FIBA World Championship. They held off the second-half comeback from Serbia to win (69-64). Spain had beaten Serbia in the first round of the qualification round (76-64) and now have the satisfaction of beating the defending champions twice during this tournament. 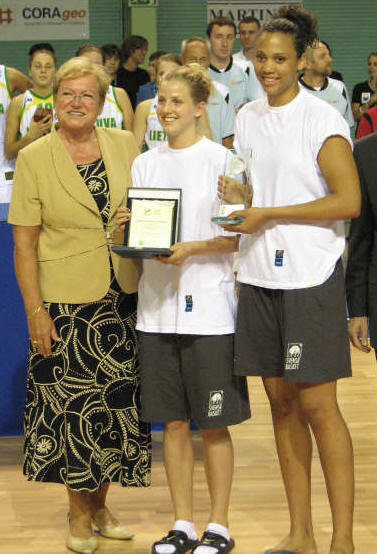 The same players from both sides led the scoring with Leonor Rodriguez top scoring for Spain with 18 points and Isabel Perez (LEFT) contributing 14 points. For Serbia Jovana Popovic, Sara Krnjic and Tina Jovonovic all finished with 13 points. Spain looked comfortable at the interval leading (39-25) but were brought back to reality when Krnjic levelled the game (53-53) during the last few seconds of the third period. Spain quickly took command of the final quarter scoring the first 6 points. Both sides struggled to impose themselves during a scrappy six-minute spell. All the same Spain's lead had grown (67-59). With the game in money-time Serbia had no choice but to take risks and scored 5 straight points (64-67) on the back of a trey from Nevena Jovanovic. The last 43 seconds witnessed the usual end-of-match time-outs where the game was played out on the free-throw line. Rodriguez split a pair with 15 seconds to go. Then Marta Tudanca hustled the ball away from Nevena Jovanovic leaving Krnjic no option but to foul her. Tudancea split the last pair of free-throws to secure the victory and a trip to the world championships. The Slovak Republic finished on a high after beating Poland (76-48) in the 7th place match. Turkey beat Sweden (76-67) for 9th place. Ukraine finished 11th after beating Bulgaria (72-60).